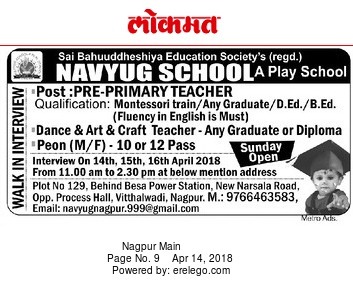 Navyug Play School, Nagpur has advertised in THE LOKMAT newspaper for recruitment of Pre Primary Teachers,Art&Craft Teacher,Peon jobs vacancies. Interested and eligible job aspirants are requested to walk-in 14th,15th,16th April 2018.Check out further more details below. Name of the School: Navyug Play School, Nagpur. About School: The emphasis at Navyug Play School is to see everything from a parents point of view. We appreciate we are being entrusted with the care of your most precious possessions, therefore we have created a caring, loving and secure environment for children from 2.4 – 5 years of age. (a) Pre Primary Teachers: Montessori Train,Any Graduate,D.Ed,B.Ed. (c)Peon: 10 or 12 pass. Interview Date: walk-in on 14th,15th,16th April 2018 from 11 a.m and 2.30 p.m to below mention address. (sunday open).